Here’s a big thanks to everyone who has participated in the current contest: You guys have done some amazing things to promote the contest out there. We’ve been really impressed! Some of you built entire websites devoted to promoting the contest. Others posted YouTube viral videos. And some of you went a little crazy on Twitter! ContestBurner Viral Marketing Contest Prizes: Less Then 24 Hours Left! Every Tuesday night I do a live web show where I teach people how to run their online businesses and increase their income with Internet marketing. On tomorrow night’s show I’ll also be announcing the winners of the $5,000 Viral Marketing Contest prizes! So you’ve got less than 24 hours to get your entries in! Entering The Contest Is Easy! Permanent link to ContestBurner Viral Marketing Contest Prizes: Less Then 24 Hours Left! This is a preview of ContestBurner Viral Marketing Contest Prizes: Less Then 24 Hours Left! . Read The Full Post Of: ContestBurner Viral Marketing Contest Prizes: Less Then 24 Hours Left! When Do You Get The Free Viral Marketing Plugin? We just launched the brand new site… stay tuned while we tweak and adjust things. We’ll be launching our very first viral contest on Twitter, FaceBook and this blog VERY SOON! 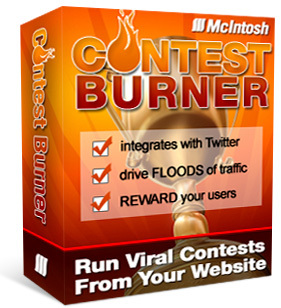 Then you’ll get your chance to download our plugin and run your very own viral contest.